The past couple of weeks my husband has been collecting gift certificates by doing surveys. He got $20 for chapters.ca and he gave them to ME! He's a good man and can cook too. So, I'll be getting package in the mail soon. Hurray! Seventeenth-century Amsterdam, a city in the grip of tulip mania and basking the wealth it has generated. Cornelis, an ageing merchant, commissions a talented young painter to preserve his status and marriage on canvas. At the sittings, as a collector of beautiful things, Cornelis surrounds himself with symbols of his success, including his young wife, Sophia. But as the portrait grows, so does the passion between Sophia and the artist; and as ambitions, desires and dreams breed an intricate deception, their reckless gamble propels their lives towards a thrilling and tragic conclusion. The town of Rossmore is a special place, full of character charm. Nestled beside the Whitethorn Woods, the town has grown since the days when it was small and friendly and everyone knew everyone else; now it has chain stories and traffic problems and housing estates. But still, there are the woods, full of spiky bushes and criss-crossed with paths; and there's St Ann's Well, where generations have come to pray or make wishes or just to look back at the pretty little town. Which is why there is going to be such a fuss about the plans for the new motorway. It's going to by-pass Rossmore, cutting through Whitethorn Woods and endangering the well itself. The new road will bring jobs and relieve traffic in the town; for others, it will destroy businesses and leave the town a backwater. The people of Rossmore are divided. There is a lot of land standing in the way of the great road of progress. Quite by accident the decision rests on Neddy Nolan - the most honest man in Rossmore. A man determined to do the right thing. Supreme masterpiece recounts in feverish, compelling tones the story of Raskolnikov, an impoverished student tormented by his own thoughts after he brutally murders an old woman. Overwhelmed afterwards by guilt and terror, Raskolnikov confesses and goes to prison. There he realizes that happiness and redemption can only be achieved through suffering. Sounds like some wonderful books and movies. I'm on the list at the library for Whitethorn Woods. I have moved up in the queue and I think they'll call me to come pick it up right about the time we leave for vacation, hehehe! I've meant to read Tulip Fever - I' eager to read your thoughts on it. I have that Maeve Binchy book. I always love her; this book is more like a collection of short stories that are loosely held together. Yeah for husbands who cook. I finished my meme. thanks for tagging me. What a great husband! Crime and Punishment is one of my favorites. 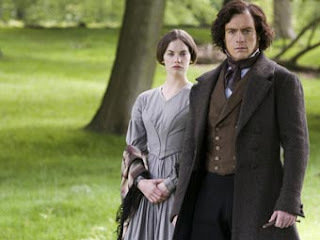 I really need to check out the Jane Eyre mini series. I wonder if Netflix carries it . . .